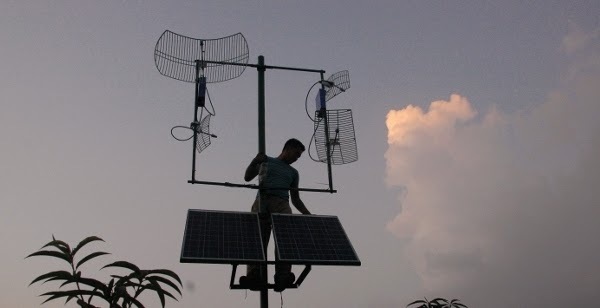 AirJaldi is a social enterprise currently operational mostly in North India aimed at providing affordable broadband connectivity to the remote parts of the country where internet access is a rarity. Establishing the infrastructure in the rural hilly areas of India is a tedious process owing to difficult terrains, unfavorable weather, lack of uninterrupted power, supply and transport costs and lack of awareness about Internet usage among the rural residents. One of the primary objectives of AirJaldi is to implement a “para poor” business model in a way that the local entrepreneurs are empowered and can run self-sustainable businesses. AirJaldi sets up the rural network infrastructure through its own resources and does not outsource any work. Local ISPs (Internet Service Providers) then purchase the network capabilities and bandwidth from AirJaldi to distribute Internet services to the people in nearby villages. AirJaldi operates in two wings: the social enterprise, AirJaldi.com, which caters to the commercial clients and the non-profit, AirJaldi.org, which focuses on R&D disseminating knowledge and training through conferences. AirJaldi has provided its services to the following places, each of which posed its own challenge in terms of weather conditions, terrains and lack of proper network infrastructure. Brought broadband connectivity to Dharamkot Government School in the mountainous region of McLeod Ganj where no other internet provider exists. Provided a steady wireless link to Bodh Gaya Bihar where the teachings by His Holiness, the Dalai Lama are streamed live. Brought internet connectivity to an isolated village school in a place with extremely unfavorable weather conditions; an AirJaldi employee hiked for 6 hours up and down the mountains in order to establish network connectivity. Internet connectivity in the remote Kumaon region of India by two AirJaldi fieldworkers who travelled from New Delhi to Kumaon (~196 miles) on their motorcycles to set up the infrastructure. To date, AirJaldi Networks owns and operates networks in the Kangra valley, Himachal Pradesh, Tehri Garhwal and Kumaon Districts in Uttarakhand, and Ranchi District, Jharkhand. They manage smaller network-related services and applications near Bangalore, Karnataka. AirJaldi’s networks will soon be expanding to rural regions of Bihar and other states in the northern and eastern parts of India. In a paper published in 2012 by one of the founders Yahel Ben-David, Department of Computer Science and Electrical Engineering, UC Berkeley and Yael Perez, Department of Architecture, UC Berkeley, the impact of the AirJaldi network is measured through Sen’s perspectives on freedom. They evaluate the AirJaldi impact on people’s lives through usage logs on the network and focus on broader development goals rather than focused development goals. Web-traffic logs were collected from September 2007 to April 2008 from the whole AirJaldi network, including more than 2100 computers serving an estimated number of 10,000 users in schools, monasteries, nunneries, medical clinics, and various NGOs. The evaluation of the data found that the AirJaldi network enhanced the communication, social, education and political freedoms of the users to a great extent. AirJaldi stands for a successful ICTD project initiative that has not only been able to meet its development goals and but has also been able to achieve its mission to enable local social entrepreneurs to develop sustainable models for rural Internet networks. Perez, Yael Valerie, and Yahel Ben-David. "Internet as freedom–does the internet enhance the freedoms people enjoy?." Information Technology for Development 18.4 (2012): 293-310. Nice to see an organization that goes the extra mile into regions all the other companies are not interested in. Can you clarify whether they are providing the broadband for free with the non-profit wing or if it follows the usual pricing. Also how does this compare to other companies in 'normal' regions. Secondly whilst it is easy to quantify and/or evaluate communication enhancement, I am not so sure we can easily tie the availabilty of internet to 'social and political freedoms'. Are there tangible results or it is the usual people have access to information so they are 'free' but on the ground nothing changes. Thanks for your comment, Chalenge! Yes, the non-profit wing provides broadband services for free to the community for different purposes. (Refer to bullet point 2 above for an example). Great question about impact evaluation. You should definitely check out the paper to see how the authors have quantified "social" and "political" freedoms. To give you a very rough idea, they categorised the website URLs browsed by the users under such buckets and observed how many times these sites were visited by these users. But please do check out the paper to understand how they did so, in detail. It's very nice to hear about the success of an ICTD company that's so dedicated to the use and development of local capacity. With how difficult the infrastructure in these remote areas are to set up, I imagine they are also difficult to maintain. Do you know if AirJaldi does maintenance themselves, train local people to maintain the infrastructure, or if perhaps the local ISPs who operate through them take up the task? Hi Crysta, great question. I googled around a little bit and found out that all of their connections are solar powered and self-sustainable so they try to make it as robust as possible. However, I could not find information about who actually takes up the maintenance tasks. I guess local ISPs might take up these cases and then defer it AirJaldi for more complicated issues. Thanks for the response! I sometimes have mixed feelings about solar panels in remote locations. My understanding is that when they do stop functioning it takes a true professional to make any repairs, and the users may not have any backup while they wait for these repairs or replacement. Of course this isn't a problem that only exists for solar panels, but any highly technical equipment in remote regions. Hopefully the income generated by the ISPs will be a strong enough incentive to motivate them to repair/replace equipment as it wears out! What an interesting organization and initiative--great example of the “para poor” business model! I love that you actually brought in a third-party evaluation to reflect on the initiative's success, but I was also wondering what your personal take was. Did you think it was a strong enough initiative to truly make a difference? Sustainable? Are you convinced? Also, what were some of the drawbacks, if you could find any? I'm also interested in Crysta's question about maintenance. Thanks for your comments, Christina. I do think this is a much needed and a great initiative that has taken up the task of providing internet services to one of the most neglected audience - the rural people living in difficult terrains. There are articles which even talk about how AirJaldi poses as a threat to the other internet providers in the market just because of its affordable pricing. However, I think the biggest drawback could be maintenance of the connections, training/educating these people to use it and scaling up to other parts of the country. Every state in India is a microcosm in its own culturally, politically and environmentally. I am not talking about metropolitans here. So, its going to be difficult for AirJaldi to set up these connections in the remote parts of different states since each of them would bring in new challenges of their own. Great post Priya! With Air Jaldi's pioneering efforts, "Right to Information Access" would soon become a fundamental constitutional right. Technology leading to The End of Lawyers? is a global social Enterprise dedicated to innovative solutions for the legal empowerment of all. © BarefootLawyers 1998-2014. The design and contents of this site are licensed under the Creative Commons Attribution-Noncommercial-Share Alike 3.0 Unported License.